Research overwhelmingly implicates low intakes of fruits and vegetables as factors influencing the prevalence of several chronic diseases and poor health (1-5). U.S. dietary goals recommend five to nine servings daily. Unfortunately, the average number of daily servings of fruits and vegetables consumed by men and women is fewer than four, and only about one fourth of adults report consuming five or more servings (6,7). According to Healthy People 2010, only 28% of Americans eat at least two daily servings of fruit; only three percent of persons consume “at least three daily servings [of vegetables], with at least one third being dark green or deep yellow” (8). Large-scale campaigns such as the 5 A Day program have increased knowledge and awareness for many Americans, but changes in actual dietary habits are small: average daily fruit and vegetable intake increased from a baseline of 3.75 servings to 3.98 servings between 1991 and 1997 (6). Some interventions have been successful, but they are typically costly and require staff-intensive approaches involving multiple in-person sessions with medical or nutrition professionals (9-11). Such interventions are not feasible in clinical or public health settings. With the heightened focus on nutrition and its role in prevention of chronic disease, it is imperative to develop cost-effective interventions that can affect larger segments of the population. Here we describe a randomized controlled parallel-group intervention with a brief, computer-based nutrition behavior-change program. Little by Little, an intervention program developed by one of the authors (GB), included a brief assessment of fruit and vegetable intake as well as messages and tips to increase intake (12,13). The study population consisted of low-income African American and white women, mean age 50.1 years (SD 7.22, range 39-65). We tested the hypotheses that subjects would demonstrate significant improvement in fruit and vegetable intake and stage of change two months after a single brief experience with the Little by Little CD-ROM program in comparison with a control CD-ROM, and that the Little by Little CD-ROM would have a greater effect on the group receiving reminder phone calls than the Little by Little group without reminder phone calls. The characteristics of the CD-ROM program are described in detail elsewhere (13). Little by Little was developed with funding from the Food and Nutrition Service of the U.S. Department of Agriculture (USDA). The purposes of the program are to assist the user to increase intake of fruits and vegetables and decrease intake of fat. We used only the fruit and vegetable module for this study. The objective of the program was to help participants move in small steps in the right direction toward increasing fruit and vegetable consumption. The program was based on several principles: screening and feedback, flexibility, and goal setting. First, the program included dietary screening of participants with a 10-item questionnaire on usual intake of fruits and vegetables (14) and immediate feedback to make the need for change individually relevant. Second, the program was designed to be flexible so that participants could choose topics of interest to them. Modules included suggestions for specific situations, such as when eating out, packing lunch, or cooking at home, and suggestions for barriers such as time and cost constraints. The suggestions focused on increasing the times and situations in the day when fruits and vegetables could be included, rather than on increasing servings or serving sizes. Third, the program included goal setting and individual commitment. To facilitate goal setting, the program suggested several goals to work toward, guided by options that the participant had chosen throughout the program, and the participant was asked to choose one or two of them. The University of California Berkeley Committee for Protection of Human Subjects approved the research, and eligible participants provided informed consent. Data collection took place during a nine-month period, from February through October 2002. We gave a $25.00 gift card from a local store to each participant as an incentive to complete the study. We recruited study participants in collaboration with nutrition advisors and staff of the California Expanded Food & Nutrition Education Program in Contra Costa and Stanislaus counties, and the University of California Cooperative Extension and Food Stamps Program in Solano County. Staff included two part-time interviewers at each site, one African American, and one non-Hispanic white. Methods of recruitment included posted flyers inviting participation of study subjects and presentations to classes sponsored by organizations and agencies serving low-income clients. Recruitment sites included community-based organizations and selected programs that provided services to the target population, such as the Welfare to Work program, Food Stamps program, and other social services programs. Recruitment efforts also targeted lower-paid staff at day care centers, Head Start programs, social service agencies, and county offices. To be eligible for the study, the individual had to be female, African American or non-Hispanic white, midlife (defined as 40 to 65 years of age), and low-income as reflected by their participation in the above programs serving low-income persons. Participants were interviewed at baseline, primarily at county offices, and were randomized to one of three intervention groups, using a computer-generated randomization scheme. Group 1 received a brief, self-guided 15- to 20-minute interactive experience with a computer-based program, Little by Little. Group 2 received the same interactive experience with the Little by Little program, plus two reminder telephone calls over the next two months. Group 3 received a computer-based, interactive experience with a non-dietary CD-ROM program, Stress Management: A Healthy Balance (Learning Multisystems, Madison, Wis), which also lasted 15 to 20 minutes. Blocked stratified randomization on race was carried out separately in each county to ensure balance on those factors across the treatment groups. For groups 1 and 2, the intervention included goal setting as well as take-home handouts and supporting materials reinforcing the suggestions and tips from the Little by Little program. Data were collected on age; level of education; race; income; number of persons in household; and food insecurity. Knowledge and attitudes about diet and health were also assessed, and participants were asked about obstacles and barriers to eating fruits and vegetables. Stage of Readiness for Change was assessed at baseline and follow-up and categorized in four stages, corresponding to Precontemplation (“No” to “Have you ever thought about eating more fruits and vegetables?”), Contemplation (“Yes” to that question), Preparation (“Planning to increase fruits and vegetables in the next one to two months”), and Action/Maintenance (“Currently trying to eat more fruits and vegetables”) (15,16). Fruit and vegetable intake was assessed at baseline and follow-up using a modification of the California Dietary Practices Survey (7). The number of fruits, vegetables, and juices consumed on the previous day was obtained through a modified 24-hour recall: for each meal, the respondent was asked whether the meal was eaten and whether any fruits, vegetables, or juices were consumed. If consumed, each fruit, vegetable, or juice was recorded. 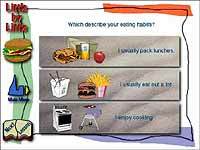 For each of four meals (morning, midday, evening, snack), up to seven items could be recorded. Portion-size pictures of ¼-, ½-, 1-, and 2-cup servings were used as references to assist participants in estimating amounts consumed. Actual drinking glasses, with 4-, 8-, 12-, and 16-ounce capacities, were used to help estimate amounts of juices consumed. Linear regression and correlation techniques were used for continuous data, and classification and chi-square evaluation were used for categorical data. Baseline comparisons between groups were examined using chi-square tests for categorical data and analysis of variance for continuous data. To evaluate the effectiveness of the intervention, analysis of covariance was used, with change score as the dependent variable and baseline level as a covariate. Potential effect modification of treatment effect by race; site; education; income; and other variables in the dataset was examined. Potential confounding by those factors was also examined. The only significant covariate was site (Contra Costa, Solano, or Stanislaus County), which was included in all models. Poverty guidelines for each household size were obtained from the U.S. government for the year 2002 (17). Poverty Index Ratio was calculated as the ratio of the reported income to the poverty guideline for that individual, based on household size. The midpoint of the income category was used to represent income. For persons who indicated that their annual income was less than $10,000, the midpoint value was set at $8,860, the poverty level for a single person. If any single persons in that income category (n = 32) had income less than $8,860, they would be calculated as having an income at the poverty level, when in fact they were below the poverty line. Missing values for income (n = 11) and weight (n = 15) were replaced with the median value. Because of small numbers in some categories of education, the lower three categories were combined into one category for some analyses. Two outcome variables were derived to estimate change in fruit and vegetable intake: occurrences and servings. Occurrences were simply the number of times a fruit or a vegetable was mentioned during the 24-hour recall. For example, a person who had orange juice at breakfast and orange juice at lunch would have two occurrences. Servings were calculated by applying a factor to each occurrence, based on the respondent's reported portion size for that food. For example, the USDA Food Guide Pyramid serving size for vegetables is ½ cup; if the respondent reported the smallest portion, ¼ cup, for green beans, she was credited with ½ of a serving of green beans. Treatment effectiveness was analyzed separately for change in occurrences and change in servings. Four hundred ninety-one low income, midlife, African American and white women were enrolled and 481 (98%) completed the study. The sample included 48.4 % African American (n = 233) and 51.6% white (n = 248) women. Table 1 describes characteristics of the study population. There were no significant differences among the intervention groups in age; race; income; poverty; body mass index (BMI); baseline Stage of Readiness for Change; or baseline fruit and vegetable intake. One factor, whether or not the participant lived alone, was significantly different across treatment groups at P = .02. Most participants worked outside the home, and for approximately half, there were children younger than 18 years in the household. The combination of income and number of persons in the household placed two thirds of the sample below the poverty line, and more than 92% were below 185% of poverty, the cut-off for a number of federal assistance programs. Almost 75% were overweight or obese. More than 70% reported that they were currently trying to improve their fruit and vegetable intake. However, the average number of times that fruits and vegetables were reported consumed at baseline was 3.4 times per day, and only about one fourth of the sample consumed five or more servings of fruits and vegetables on the day of the survey. Change in occurrences was significantly higher in both Little by Little groups than in the stress-reduction group (Table 2). There were no significant interactions with race, site, education, or other factors. The Little by Little group with phone calls increased fruit and vegetable intake by 1.32 occurrences per day, compared with 0.71 occurrences per day in the stress-reduction group (P = .016). The Little by Little group with no telephone follow-up increased fruit and vegetable intake by 1.20 occurrences per day, also significantly greater than the stress-reduction group (P = .052). The Little by Little group with the phone calls increased fruit and vegetable intake 86% more than the stress-reduction group, and the Little by Little group with no telephone follow-up increased fruit and vegetable intake 69% more than the stress-reduction group. It is notable that intake of fruits and vegetables increased in the stress-reduction group as well. In preliminary analyses, change in servings was not significantly different across intervention groups. A significant interaction with education level was found, however, and results are presented separately by education level (Table 3). For those with a high school education or less, there was a significantly greater increase in fruits and vegetables in the Little by Little group with telephone reminders, compared with the stress-reduction group. In contrast, among those with an education beyond high school, neither Little by Little group had a significantly greater increase in fruits and vegetables than the stress-reduction group. Instead, the stress-reduction group had a substantial increase in fruit and vegetable intake (1.32 servings). Both Little by Little groups increased in Stage of Readiness for Change, but only the Little by Little group with telephone follow-up was statistically significant (P = .01) compared with the stress-reduction group (Table 4). Among individuals not already in the “currently trying” stage at baseline, 73% of individuals in the two Little by Little groups moved forward in stage, compared with 58% in the stress-reduction group (data not shown). This study has demonstrated that the number of times that fruits and vegetables are consumed by an individual in a population of low-income women can be increased by a single experience with the Little by Little interactive CD-ROM. In addition, Stage of Readiness for Change was improved, and 73% of those not already at the implementation stage had some forward movement. The U.S. Preventive Services Task Force (USPSTF) has extensively reviewed the effectiveness of interventions to improve dietary behavior (9). The analysis concluded that “moderate- or high-intensity counseling interventions, including the use of interactive health communication tools, can . . . increase intake of fruit and vegetables. Brief counseling of unselected patients by primary care providers appears to produce small changes in dietary behavior.” Two studies published since that review are consistent with the review’s conclusion: Stevens et al (18) and Steptoe et al (19) found significant improvements following either two 45-minute counseling sessions, including computer interaction (18), or two 15-minute individual counseling sessions by research nurses (19). We are not aware of any other research in which a single, brief exposure to an interactive CD-ROM, without any individual counseling, produced significant increases in fruit and vegetable intake. It is difficult to compare effect sizes across different studies because of differences in the methods of measurement and differences in the intervals between intervention and evaluation. Among the interventions to increase fruit and vegetable intake reviewed by the USPSTF and the two more recent studies mentioned above, the interval between intervention and measurement of behavior change ranged from two to 18 months. We report here on results after a two-month interval; a one-year follow-up is in progress. For method of measurement, most studies used some form of food-frequency questionnaire, whereas we used a modified 24-hour recall, generally considered more accurate when information on absolute amount of intake by a group is desired, rather than just a ranking (20). According to the classification system used by the USPSTF (9), the effect size found in our study would be considered “medium.” Our effect size does not reach “large” primarily because the control group also had a substantial increase in fruit and vegetable intake. The outcome variable that was most consistently affected was occurrences of eating fruits and vegetables, while servings were increased only in the less educated participants. There are a number of possible reasons for this. First, the suggestions and goals offered by the Little by Little program are almost exclusively aimed at increasing occurrences. Tips focused on increasing the frequency with which fruits and vegetables were chosen, such as “I will have a piece of fruit with breakfast,” rather than on portion size, such as “I will eat a larger portion of green beans.” It is also notable that among those with more than a high-school education, persons in the control (stress reduction) group increased their intake dramatically. The Little by Little groups increased by approximately one serving, but the more educated women within the stress-reduction group increased intake by 1.32 servings. It is possible that stress reduction, itself an important health factor, was more important in the lives of those participants. A second possible explanation is that the baseline dietary assessment was itself an important intervention in that group. Abundant anecdotal evidence shows that simply completing a dietary questionnaire can have an effect on dietary habits in some individuals, with responses like “Wow, I never realized I ate so few fruits and vegetables.” Perhaps this was particularly true in the higher education group. As noted, the control group increased by 0.70 occurrences overall and by 1.32 occurrences in the higher education group. This alone may be sufficient justification for conducting routine dietary assessment screening as a potentially useful nutritional intervention. Regardless of the explanation for the greater apparent effectiveness in increasing the number of occurrences, it is the opinion of one of the authors (GB) that it would be more prudent public health advice to encourage people to increase the number of occurrences, rather than focusing on the number of servings. Recommending “five to nine servings” requires people to learn the definition of a serving, and the recommendation itself probably seems unreachable to many people. (In addition, the epidemiologic literature upon which such recommendations are made has at its basis a calculation of number of times per day, not calculations involving units of measure.) Instead, what is most important is simply that fruits and vegetables show up more often in the daily diet of the population. People already know what a fruit or a vegetable is (salads count, juices count), and they can simply count the number of times they show up on the plate. However, for Asian or Hispanic populations where mixed dishes are the norm, it may be important to have an additional focus on increasing the amount of the vegetables consumed. Behavior change is difficult, and previously only extensive, intensive interventions have been successful in changing dietary habits (9,21). The finding that a brief, one-time intervention could actually achieve dietary change is surprising, even to the authors. Why was it successful? We believe there are a number of factors. First, it should be acknowledged that midlife women are probably the one group most likely to be receptive to any dietary improvement messages (22). In addition, however, we believe that several features of the Little by Little program play a key role in its success: the initial dietary screening and feedback; the element of individual choice; the simplicity of the small steps suggested; and goal setting. The first critical feature is the Little by Little dietary screening questionnaire that begins the program. People are unlikely to undertake change based on generalizations about what the whole population should be doing. Instead, people are more likely to respond to personalization. Research has shown that many people overestimate their fruit and vegetable intake (23), and think their own dietary intake needs no improvement (24). Consistent with Weinstein’s Precaution Adoption Process model (25), baseline evidence of personal risk behavior is an essential precursor to successful behavior change. Individuals are likely to want to change, or even to hear messages about nutrition, only if they have been shown the areas in which their own dietary intake is not up to the recommended levels. In addition, it is possible that the simple process of asking individuals to reflect on their diets and to report on their intake is relevant, even if they are reporting that information to a computer. Physicians rarely ask patients to reflect or report on their dietary habits (8); being asked in the Little by Little program is evidence that “somebody” cares and considers it important. Evidence in the tobacco literature shows that if individuals are simply asked or told by a physician to stop smoking, their chances of quitting improve (26). Also probably critical is that the program responds instantly to participants with feedback and information that is directly based on information they provided. Once again, it is not generalization, but personalization. In a related issue, the program asks participants to indicate perceived barriers to eating more fruits and vegetables, factors such as “it costs too much,” “it takes too much time,” and “the family doesn't like them.” The program offers this additional opportunity for participants to tell “someone” about their problems. The second key factor in the success of the Little by Little program is the element of individual choice. The program was not designed as a type of course or set program of information, tips, and experiences to be presented and used by all participants in an identical way. Rather, the program presented a variety of options, and each participant selected only the ones in which she was interested. Participating in all program modules easily takes an hour or more, but most participants spent no more than about 15 minutes participating only in the program components they deemed most relevant. Research has shown that the ability to make individual choices enhances participation and attention (27,28) and ultimately leads to learning and behavior change. The third critical aspect is that the changes proposed by the Little by Little program are easy to put into practice. The very name of the program, Little by Little, emphasizes ease. We cannot expect people to make wholesale changes in their behavior, and they may fear to undertake any change if they believe it will be too difficult. As participants explored different modules of Little by Little, they were offered easy, common-sense tips and suggestions to move them toward their dietary goal. The objective was to move them in the right direction toward increasing their fruit and vegetable intake, even if only in small increments. A fourth critical aspect of the Little by Little program is goal setting. When participants had completed as many of the modules as they chose to, the program presented a list of small, easy goals based on the modules they had explored. The program asked them to choose one or two goals to work toward during the next month or so. Such goals were, “I will have one vegetarian meal each week” or “I will take a piece of fruit to work for a snack.” At the conclusion of each session, we gave participants a printed copy of their baseline dietary screening results and a copy of their chosen goals. Another aspect that may have contributed to the program’s success is that computer screens are similar to television screens, providing a familiar, non-threatening, and credible medium to program participants. Many participants were women who had little or no experience with computers, yet they required only a few seconds of instruction on using the mouse and had no difficulty using the program independently. Rather than appearing reluctant or intimidated by the computer, participants seemed to find the experience enjoyable and to appreciate the opportunity to use a computer. Finally, the personal contact between interviewers and participants prior to the start of the CD-ROM experience probably was influential. For the most part, interviewers were of the same ethnic group as participants, and most interviewers were also low-income. In addition, in the group that received the two reminder phone calls, the calls were made by the same interviewer who had interviewed participants at baseline and introduced them to the CD-ROM. It is worth noting that the Little by Little program did not tailor the intervention to the participants’ Stage of Readiness for Change or Self-Efficacy. Rather, the program was based on behavior change and learning theory and on respect for the participants’ ability to choose input, tips, and goals consistent with her self-perceived constraints and lifestyle. In summary, the following characteristics are key to the success of the Little by Little program: 1) baseline screening and feedback about the participant's current intake status; 2) flexibility, individual choice, and exploration; 3) easy, small steps; and 4) goal setting. While we tested the Little by Little program among low-income persons, the program is appropriate for any English-speaking adults with access to a computer. In 2001, 60.2 million U.S. homes (56.5%) had a personal computer (29). More important, a much larger proportion of Americans, 65.6%, are computer users at some location, including worksite, public library, community center, or someone else’s house. Even among the lowest income category, those with an annual household income under $15,000, approximately 25% were computer users in 2001, and that proportion is growing at a rate of 25% per year (29). Other locations that could increase computer access for low-income persons include WIC (Special Supplemental Nutrition Program for Women, Infants, and Children) and Food Stamp offices, employment offices, and senior centers. The components of the Little by Little program translate easily into many public health settings. In its original testing phase, the program was administered in libraries and senior centers (13). Equally important, the components could be integrated into clinical practice. The USPSTF concluded that “interventions using self-help materials and interactive communications . . . along with brief provider advice produced medium changes and appeared to be relatively feasible for use in primary care practices.” The brief screening questionnaire exists in both computerized and one-page, paper-and-pencil form (14,30), is self-administered, and could become part of the patient record. Combined with a 30-second admonition by the provider that “Your diet is too low in fruits and vegetables; you need to eat more of them,” the screening questionnaire alone could have some effectiveness, based on the experience with smoking cessation. This study suggests that real dietary change could be achieved if health care providers followed up the screening by loaning the Little by Little CD-ROM to patients or by making it available in their waiting rooms. The Little by Little CD-ROM may be obtained from the School of Public Health, University of California, Berkeley, by sending an e-mail to LittlebyLittleUC@netscape.net. We acknowledge the contribution of Dr. Clifford Block, who was instrumental in making Little by Little an effective behavioral intervention, and of Mary Miller (Interactive Design and Development, Inc., Blacksburg, Va) who contributed to the design and development of the Little by Little CD-ROM. We thank the interviewers for their extraordinary contribution: Barbara van Riet, Rose Romant-Todd, Georgia Hall, Akili Shabazz, Pamela Nicholson, and Jacqueline Walton; and the following students for their assistance: Nancy Wei, Stefanie Chin, and Huy Phu Pham. Original development of the Little by Little CD-ROM was supported by USDA grant # RFA-FCS-95-037SUZ. The present study was funded by Centers for Disease Control and Prevention grant U48/909706-09. The participants made the study possible, and we are grateful for their contribution. Author affiliations: Patricia Wakimoto, DrPH, RD, Rochelle Mandel, University of California, Berkeley, School of Public Health, Berkeley, Calif; Diane Metz, Solano County Cooperative Extension, University of California, Davis, Davis, Calif; Mary L. Fujii, MS, RD, University of California Cooperative Extension, Contra Costa County, Pleasant Hill, Calif; Nancy Feldman, MS, RD, Barbara Sutherland, PhD, California Expanded Food and Nutrition Education Program, University of California, Davis, Davis, Calif.
Glade MJ. Food, nutrition and prevention of cancer: a global perspective. Nutrition 1999 Jun;15 (6):523-6. Block G, Patterson B, Subar A. Fruit, vegetables, and cancer prevention: a review of the epidemiologic evidence. Nutr Cancer 1992;18:1-29. Rimm EB, Ascherio A, Giovannucci E, Spiegelman D, Stampfer MJ, Willett WC. Vegetable, fruit, and cereal fiber intake and risk of coronary heart disease among men. JAMA 1996;275:447-51. Gillman MW, Cupples LA, Gagnon D, Posner B, Ellison R, Castelli W et al. Protective effect of fruits and vegetables on development of stroke in men. JAMA 1995;273:1113-7. Appel LJ, Moore TJ, Obarzanek E, Vollmer WM, Svetkey LP, Sacks FM et al. A clinical trial of the effects of dietary patterns on blood pressure. DASH Collaborative Research Group. N Engl J Med 1997;336:1117-24. Stables GJ, Subar AF, Patterson BH, Dodd K, Heimendinger J, Van Duyn MA, et al. Changes in vegetable and fruit consumption and awareness among US adults; results of the 1991 and 1997 5 A Day for Better Health Program surveys. J Am Diet Assoc 2002;102:809-17. Foerster SB, Gregson J, Wu S, Hudes Ml. 1997 California dietary practices survey: focus on fruits and vegetables, trends among adults, 1989-1997, a call to action. Sacramento (CA): California Department of Health Services;1998. U.S.Department of Health and Human Services. Healthy People 2010: understanding and improving health. 2nd ed. Washington (DC): U.S. Government Printing Office; 2000 Nov.
Bowen D, Ehret C, Pedersen M, Snetselaar L, Johnson M, Tinker L et al. Results of an adjunct dietary intervention program in the Women's Health Initiative. J Am Diet Assoc 2002;102:1631-7. Hebert JR, Ebbeling CB, Ockene IS, Ma Y, Rider L, Merriam PA, et al. A dietitian-delivered group nutrition program leads to reductions in dietary fat, serum cholesterol, and body weight: the Worcester Area Trial for Counseling in Hyperlipidemia (WATCH). J Am Diet Assoc 1999;99:544-52. Block G. Little by Little: Eat Better for a Better You [CD-ROM]. 1st Ed. Berkeley (CA): University of California; 1998. Available from: LittlebyLittleUC@netscape.net. Block G, Miller M, Harnack L, Kayman S, Mandel S, Cristofar S. An interactive CD-ROM for nutrition screening and counseling. Am J Public Health 2000;90:781-5. Prochaska JO, DiClemente CC. Stages and processes of self-change of smoking: toward an integrative model of change. J Consult Clini Psychol 1983;51:390-5. Prochaska J. A transtheoretical model of behavior change: implications for diet interventions. In: Henderson M, Bowen D, DeRoos K, editors. Promoting dietary change in communities: applying existing models of dietary change to population-based interventions. Seattle (WA): Fred Hutchinson Cancer Research Center;1992. p.37-50. HHS Poverty Guidelines [Internet]. Washington (DC): U.S. Department of Health and Human Services; [updated 2004 Mar 16; cited 2004 Apr 13].Available from: URL: http://aspe.hhs.gov/poverty/figures-fed-reg.shtml. Stevens VJ, Glasgow RE, Toobert DJ, Karanja N, Smith KS. One-year results from a brief, computer-assisted intervention to decrease consumption of fat and increase consumption of fruits and vegetables. Prev Med 2003;36:594-600. Steptoe A, Perkins-Porras L, McKay C, Rink E, Hilton S, Cappuccio FP. Behavioural counselling to increase consumption of fruit and vegetables in low income adults: randomised trial. BMJ 2003;326:855-60. Willett W. Nutritional epidemiology. New York (NY): Oxford University Press;1990. 528 p.
Counseling to promote a healthy diet [File inventory] Systematic Evidence Review No. 18. Agency for Healthcare Research and Quality. Rockville (MD): April 2002. Available from: URL: http://www.ahrq.gov/clinic/prev/hdietinv.htm. Henderson MM, Kushi LH, Thompson DJ, Gorbach SL, Clifford CK, Insull W, et al. Feasibility of a randomized trial of a low-fat diet for the prevention of breast cancer; dietary compliance in the Women's Health Trial Vanguard Study. Prev Med 1990;19:115-33. Dinkins JM. Beliefs and attitudes of Americans towards their diet. Insight #19. Washington (DC): Center for Nutrition Policy and Promotion, U.S. Department of Agriculture;2000. Kottke TE, Battista RN, DeFriese GH, Brekke ML. Attributes of successful smoking cessation interventions in medical practice. A meta-analysis of 39 controlled trials. JAMA 1988;259:2883-9. Mullen PD, Green LW. Educating and counseling for prevention: from theory and research to principles. In: Goldbloom RB, Lawrence RS, editors. Preventing disease: beyond the rhetoric. New York (NY): Springer-Verlag;1990:p.474-9. Janevic MR, Janz NK, Dodge JA, Lin X, Pan W, Sinco BR et al. The role of choice in health education intervention trials: a review and case study. Soc Sci Med 2003;56:1581-94. A nation online: how Americans are expanding their use of the internet. National Telecommunications and Information Administration, U.S. Department of Commerce. Washington (DC): 2002. [Accessed 2004 Mar 15]. Available from: URL: http://www.ntia.doc.gov/ntiahome/dn/anationonline2.pdf. Johnson RK. Dietary intake — how do we measure what people are really eating? Obesity Research 2002;10S: 63S-68S. aSignificance of difference of characteristics across intervention groups, by chi square. bQuestions on food insufficiency and food stamp participation were not asked of persons with income above $35,000. Some persons with higher incomes could be food insufficient because of the number of persons that income had to support, but they are not included in this count. d60 participants declined to answer. aLeast squares mean for change, from analysis of covariance model adjusted for baseline level and site. bCompared with stress-reduction CD-ROM intervention group. aIncludes persons who were already at the top of the scale, Action/Maintenance, at baseline. b Least squares mean for change, from analysis of covariance model adjusted for baseline level and site. One unit (1.0) equals a move of one level in the four Stage of Readiness for Change level (see Methods) (15,16). cCompared to stress-reduction CD-ROM intervention group.